Over the previous newsletters we have discussed healthy eating and drinking leading up to the Big Day! Nowadays there are many misconceptions regarding food and diet. There are countless sources of dietary information available at our fingertips, but often with varying levels of evidence-based research and providing conflicting messages. 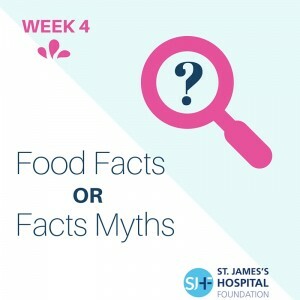 This week we will help to clarify a number of these common misconceptions and separate the food facts from the food myths. It doesn’t have to be expensive. You can keep the costs down by buying canned fruit and veg, which doesn’t go off as quickly. Choose canned fruit in its own juice – it’s healthier than fruit in sugary syrup. Or try canned veg in water with no added salt or sugar. Frozen is even handier, as you can use what you need and put it back in the freezer! And buying fresh fruit and veg when it’s in season is usually cheaper too. Local markets can be great places to pick up fresh and tasty produce at really good prices. Just add a portion of vegetables into your go-to dishes. Try spinach with pasta or peppers in tacos. Pack your child’s lunch bag with fruits and veggies: sliced apples, a banana or carrot sticks are all healthy options. You’ll hit your 5-a-day before you know it. High is more than 1.5g salt (0.6g sodium) per 100g. These foods may be colour-coded red. Low is 0.3g salt (0.1g sodium) or less per 100g. These foods may be colour-coded green. Eating fewer carbohydrates may produce weight loss, but including certain carbohydrate-containing foods actually helps promote a healthy weight, according to the Harvard School of Public Health. Whole grains, such as brown rice, are digested more slowly than refined grains such as white rice, possibly preventing hunger. And a New England Journal of Medicine study found that adults who increased their intake of whole grains, whole fruits and vegetables over the course of 20 years gained less weight than those who didn’t. Instead of avoiding carb-containing foods, it’s better to get into the habit of eating healthier choices. Grapefruit does not “burn off fat”. The only way to lose weight is to reduce calorie intake, preferably combined with increased exercise. Grapefruit however, is very low in calories and can be eaten freely by those wanting to lose weight. Margarine contains the same amount of fat as butter (80%) and so the same calories. Only spreads labelled “low in fat” or “light” contain less fat and calories. Recent evidence has linked a high intake of added sugars to an increase in body weight. Growing evidence suggests that drinking sugar sweetened drinks is linked with increased risk of Type 2 Diabetes and other chronic diseases including high blood pressure, high cholesterol and coronary heart disease (CHD). There is also strong evidence linking the intake of added sugars to tooth decay. Vegetable oil, lard and dripping all contain equal amounts of fat and therefore equal calories. Polyunsaturated or monounsaturated oils (e.g. corn oil, olive oil, sunflower oil, rapeseed oil) contain a better type of fat than lard or vegetable oils but they are equally fattening. Fish is a rich source of protein and many of the vitamins and minerals that you need for good health. Oily fish is a rich source of Omega 3 fats which help reduce your risk of heart disease and help to keep your brain healthy into old age. Examples of oily fish include; salmon, sardines, mackerel and trout. Fish also contains Vitamin D which helps you to absorb the calcium from your food improving bone health. Next time, we will consolidate the information we have covered so far and focus on some last minute tips before the Big Day!